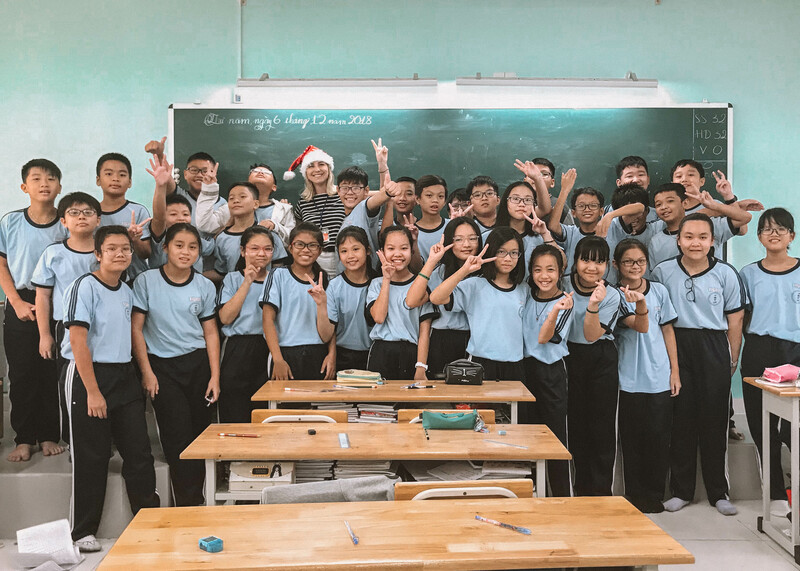 I originally moved to Vietnam to pursue a dream of living in Asia and teaching English, but over the past few years my role as a teacher has morphed from teaching English as a second language into teaching Science and Maths. My university background is in science so it makes perfect sense to use my degree and specialise in science education. 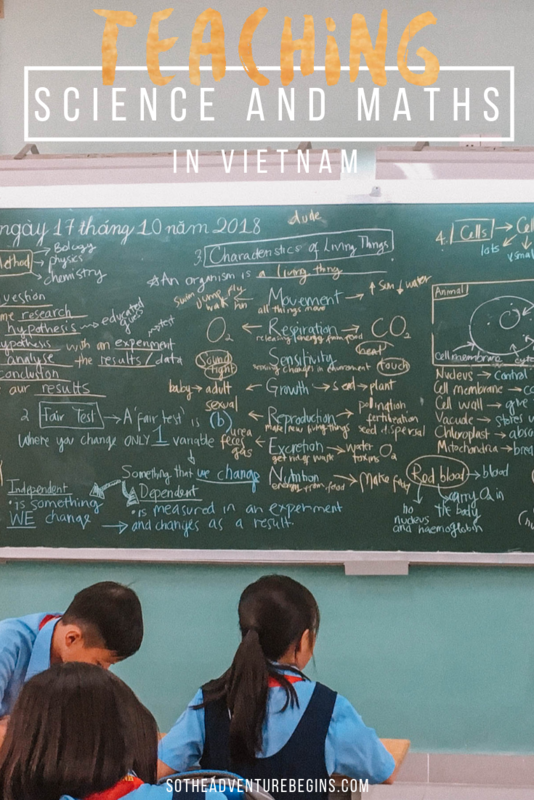 I regularly receive messages and emails curious about how I managed to find a public school job teaching science and maths in Vietnam so I thought I’d lay out all the details here for anyone who fancies it too! I work for a company called EMG Education which has offices in both Ho Chi Minh City and Hanoi. As a secondary level teacher at EMG you can specialise in their science and maths program, or their English program. It’s only in the secondary program that you get to specialise; primary teachers at EMG teach all three subjects (science, maths and English). Classes are taught in public school and run through all grades. Normally you specialise in one grade, for example I only teach grade 6. This means that I am teaching non-native students science and maths in English (essentially it’s a specialised English vocabulary lesson). If you have a background in anything science related then you are eligible to teach the EMG secondary science and maths program (for example I have a biology degree but I work alongside like likes of engineering graduates geologists and computer programmers). Normally teachers do both science and maths subjects, but it is possible to specialise in the higher grades of one subject only. If you don’t have a science background then you can still teach the primary program where you teach simple science and maths to elementary grades. Schedule: Monday to Friday, 8am – 5pm. Each teacher has 2 classes a day, one in the morning and one in the afternoon plus two free blocks to prepare throughout the week. The students: This is a public school program so the students are all Vietnamese, non-native English speakers. This means the English ability can vary among students but there is an entrance exam students need to pass in order to study the EMG program which means students have to have at least basic English. Class size: Classes range in size depending no the school – my smallest is 29 and the largest is 34 kids. The biggest class size I’ve heard of is 37. Semester dates: Public school semesters run from the end of summer to Tet (which is Vietnams biggest holiday of the year and normally falls at the end of Jan) and then semester 2 runs from Feb until the end of May. Vacation time: All national holidays are paid vacation (this includes a number of days throughout the year plus Tet). On average companies offer 22 days paid vacation a year. **Christmas is not a national holiday in Vietnam so it is not guaranteed (this year almost all EMG classes were cancelled on Christmas Day). 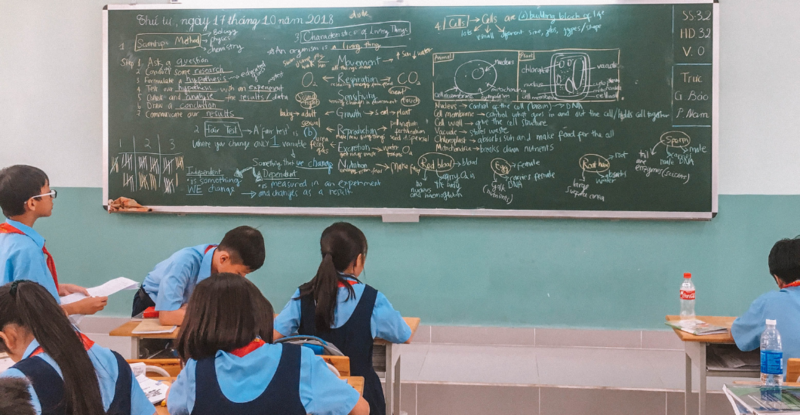 What is it like teaching science and maths in Vietnam? I personally find it much more engaging and enjoyable as a teacher teaching these non-conventional “English” classes (this is compared to working at a language centre last year). Normally each teacher is assigned 4 classes which you teach twice a week each, once for science class and once for maths class. EMG follows a UK curriculum (similar to GCSE’s) and provides full lesson plans, materials and textbooks, so there is actually little prep required outside of familiarising yourself with the materials. One of my favourite parts of this teaching position is the science experiments we do (not every science class but the majority have experiments involved). There isn’t as much development support or teaching guidance as I received at my language centre job. This makes me feel like working at public school is better suited to teachers who have had a some experienced already. That’s not to say you can’t do it, I work with lots of first time teachers who do absolutely fine. The biggest downside to me of this position is that there isn’t as much flexibility in taking vacation time during the semester (it’s not impossible but it is discouraged) with emphasise put on taking time off in the summer months when classes don’t need covered. What are the requirements for teaching science and maths in Vietnam? The requirements are the same as for any English teaching position in Vietnam, which you can see detailed in more depth in this posts. This means you will need a TEFL or higher qualification even though you aren’t directly teaching English. The only difference is that to work as a science and maths teacher you need background (aka a degree or work experience) in science/maths. If you are interested in applying to work for the same company as me then you can find more information on their recruitment website. If you have any more questions about how I transitioned from teaching English to teaching science and maths in Vietnam please send me an email! I find it much more engaging and enjoyable teaching science and maths and I highly recommend it to anyone with a science background! Hi Frances! So I have a Bachelor’s of Science degree, but in psychology. Would that count as a science degree? Or does it need to be in bio, chem, or physics? Thanks! !